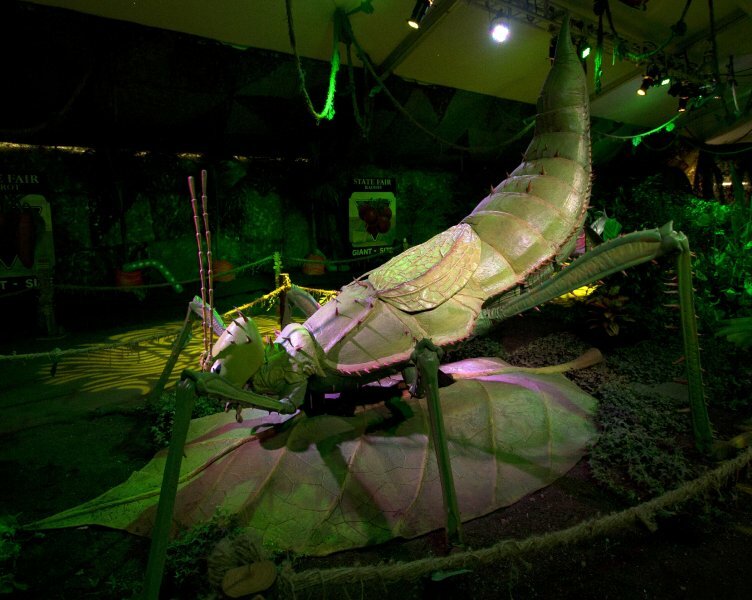 Wander the World of Giant Insects (1), a diverse collection of colossal insects. These carnivores and herbivores crawl, fly, camouflage, and metamorphose. Watch two 11 ft. male Atlas beetles (Chalcosoma atlas) lock horns in a battle over mates in Asia. Hear the loud hissing sound of a 22 ft. jungle nymph stick insect (Heteropteryx dilatata) rubbing its wings together in self-defense. 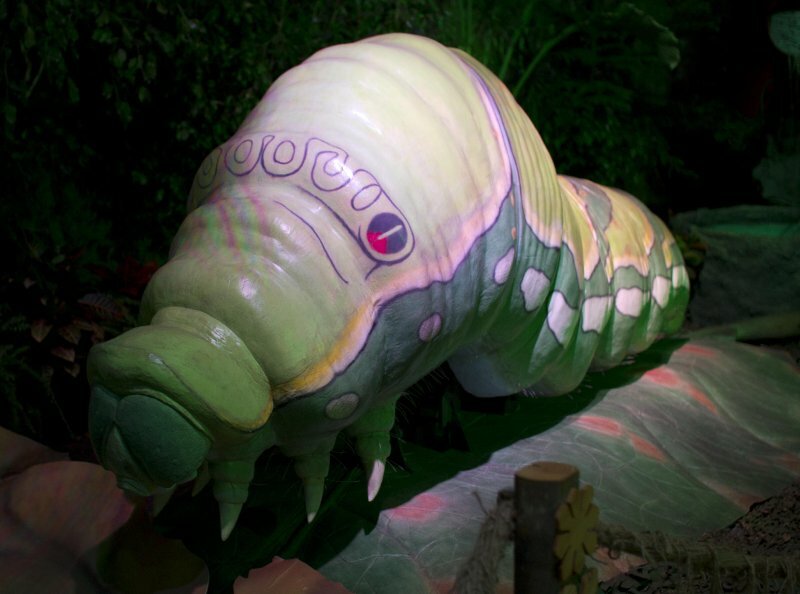 Forage for plants with a 15 ft. caterpillar (Papilio xuthus) in Asia before it morphs into a swallowtail butterfly. Travel with a 12 ft. desert locust (Shistocerca gregaria) as it consumes vegetation across dry regions. 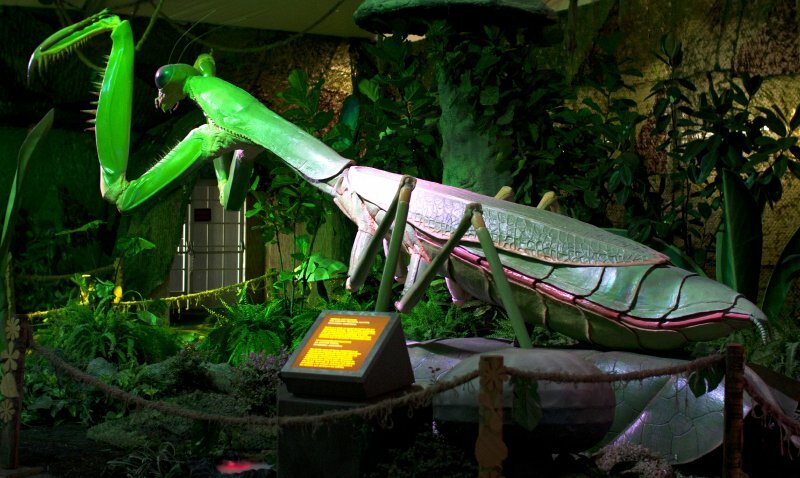 Stand in front of a 19 ft. praying mantis (Tenodera aridifolia) while it prepares to lunge at prey with its forelegs. 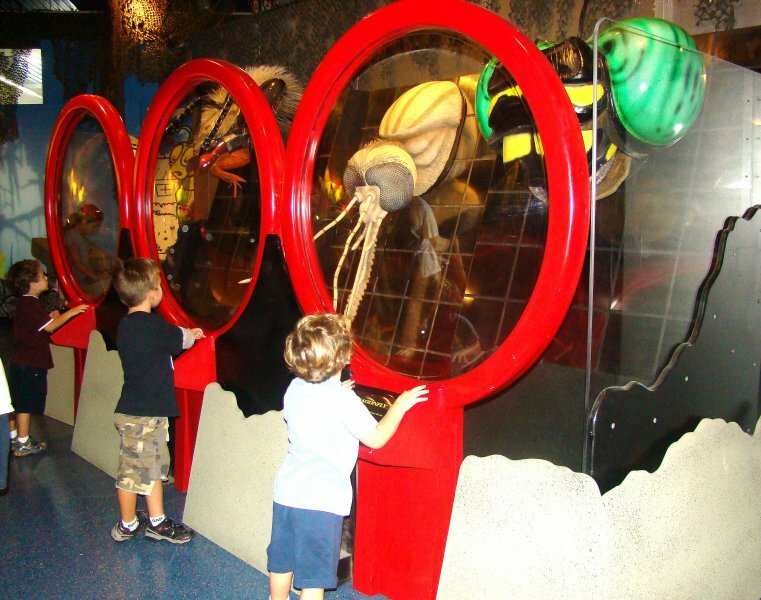 Operate animatronic dragonfly, honey bee, and mosquito heads while gazing through massive magnifying glasses. Put insect experts to the test with the Bug Bytes quizzes. Embark on a journey that is out of this world! A praying mantis prepares to lunge at prey with its forelegs. A jungle nymph rubs its wings together in self-defense. Two male Atlas beetles lock horns while battling for mates in Asia. A caterpillar inches across a leaf in Asia before morphing into a swallowtail butterfly. 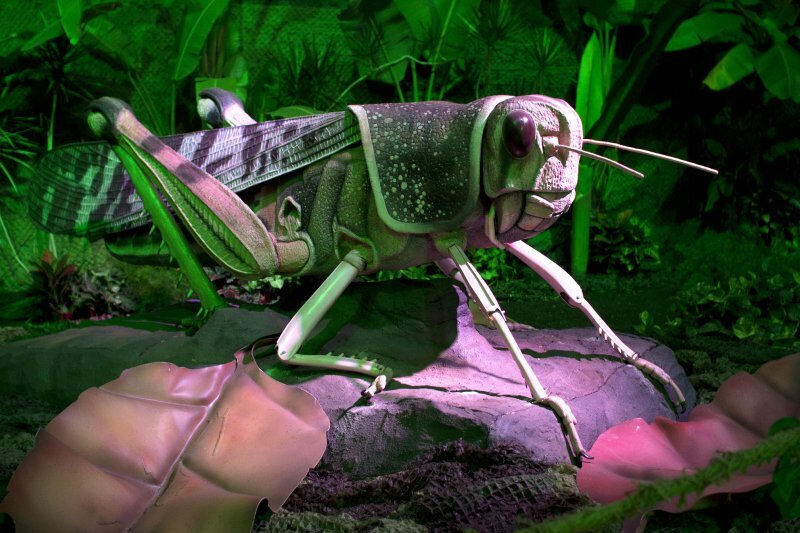 A desert locust consumes vegetation while traveling vast distances across dry regions. 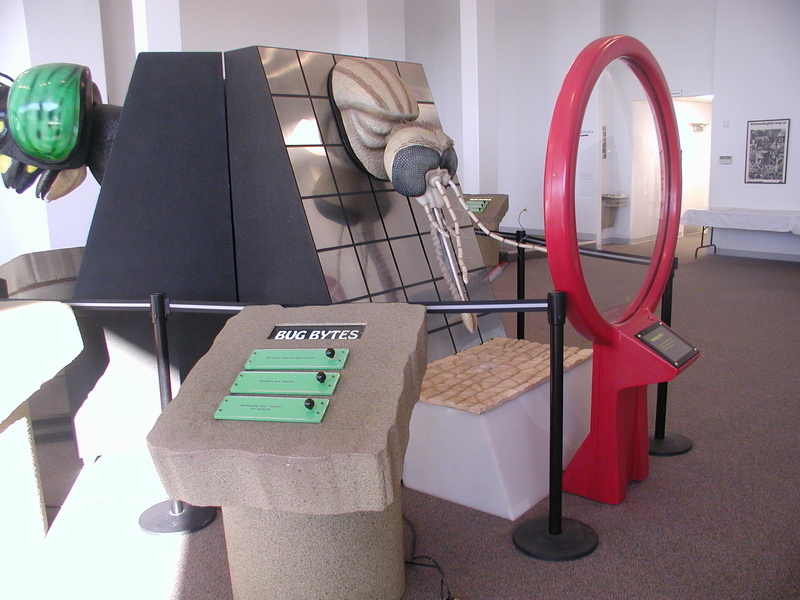 Operate robotic dragonfly, honey bee, and mosquito heads while gazing through massive magnifying glasses. Put insect experts to the test with six Bug Bytes quizzes.